Workshop participants at the Regenerative Design Institute building a clay wattle shear wall. Clay wattle (or “pajareque” in Spanish) is a variation on wattle and daub that I developed while living at Emerald Earth. I had framed a small building for wattle and daub, but when I went into the woods looking for straight sticks to weave, I came up blank. (When you look closely, most branches of mature trees are not very straight. To get good wattle material, you coppice a tree by cutting it down close to the ground. Later, you can harvest the straight new shoots for use in building or basket weaving.) Using the materials I had on hand, I took a handful of rice straw and dunked it in thick pudding-like clay slip. This gave me a long, flexible, sticky strap I could weave with. 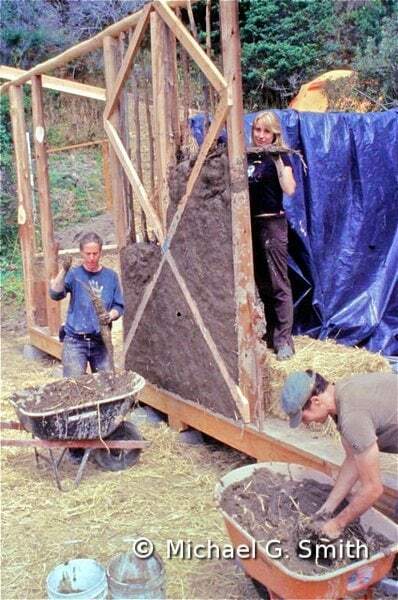 Clay wattle is faster than traditional wattle and daub since the weaving and plastering steps happen at the same time. The high fiber content makes an extremely strong wall that is great for interior partitions or unheated outbuildings. In very mild climates it could make good exterior walls for a home.